Will work with ALL Turtle Beach headsets that are compatible with the Xbox One including XO7, XO4, Stealth 500x, Stealth 800x, XO ONE and X42's. The gamepad keyboard is designed for the Xbox One controllers, it perfectly works with the original old and new controllers when using the headphone, and compatible with various system Xbox One console. It is easy to use, and convenient to input letters and have group chat when playing games. 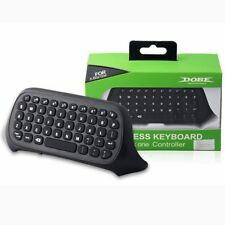 Features: Designed with number keys from 0-9 and 26 English letter keys and some assistant keys, 47 keys in total. Adopting 2.4G wireless protocol to transfer data, need to keep the attached receiver inserted in the keyboard. Features LED green back light, can enjoy game playing even in the dark. Automatically powered by the controller to which is connected. Contains 3.5mm Audio Jack port on the bottom, which fits all kind of 3.5mm audio devices (headphones, earb. 3.5mm Headphone/Headset/Earphone Adapter Splitter. 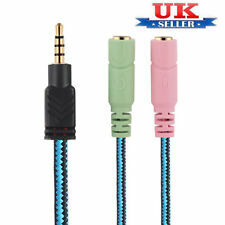 3.5mm (4 Poles) Male to 2 Female Y Audio Splitter Cable,Turns a 3.5mm combo. – one 3.5mm headphone jack and one 3.5mm microphone port. Works with 3.5mm jack on IPhone,IPod,IPad. All our Product's have a 30Day Return's Policy Description/Feature's GRADE A HIGH QUALITY GOLD PLATED PRODUCT talkback adapter cable will allow you to use your PC gaming headset with mic on either laptops and pc's and allows you use for live chat & phone calls 2 x 3.5mm female jack, 3.5 mm Jack Model also compatible with XBOX ONE, XBOX ONE S ,XBOX ONE X ,PLAYSTATION 4 Dispatch Times & Postage all sales before 1pm will be dispatch the Same day any sales after 1pm will be dispatched the next working day return's policy & payment details below thank you for looking & please take a look at my ebay shop. Description/Feature's Combo Audio Adaptor: 2 x 3.5mm female jack plug to 1 x 3.5mm male jack plug. Perfect for sharing a single headphone socket. Ideal to use it on some newer laptops, xbox one, ps4, pc gaming headset, mobile phone, Tablet. Work with any headphone/mic setup that is base of a 3.5mm jack. Clearly labelled adapter: colours and symbols for easy identification of mic and headphone inputs. 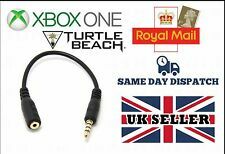 What You Get: 1x 3.5mm audio splitter cable; GRADE A HIGH QUALITY GOLD PLATED PRODUCT talkback adapter cable will allow you to use your PC gaming headset on either the XBOX One or the PS4 so you don't have to buy a new headset 2 x 3.5mm female jack, 3. 1 X Headset Adapter. One key to mute the microphone. Plug and play, fit for any 3.5mm audio jack. Output: 3.5mm audio jack. Input: 3.5mm audio port. ITEM HAS BEEN CUT OFF CHAT HEADSETS. Stereo 3.5mm Headset Adapter Headphone Converter For Xbox One Game Controller. Condition is Used.Dispatched with Royal Mail 2nd Class. ALL OUR PRODUCTS HAVE A 30DAY RETURNS POLICY FOR YOUR PEACE OF MIND Description/Feature's GRADE A HIGH QUALITY PRODUCT AUDIO / MICROPHONE headphone SPLITTER for 3.5mm Audio Jack This handy adapter can be used split the audio output from your device Your devise such as smartphone, amplifier, pc or laptop must have 3 segment 3.5mm socket. Useful for handheld microphone with separate speakers or Headset Package: 1 x Audio/Mic Splitter Adapter 1x 3.5mm female jack, 3.5 mm Jack Model compatible WORKS ON ANYTHING WITH A 3.5MM PORT, I Phones , samsungs , mobile phones with 3.5mm port, Dispatch Times & Postage all sales 1pm will be dispatch the Same day any sales after 1pm will be dispatched the next working day return's policy 30DAYS thank you for looking & please take a look at my ebay. For GBA / GBA SP only, not for GBC. Cable Colour: Black. Allows you to use standard 3.5mm headphones on your GBA SP console. 3.5mm Headphone/Earphone Jack Adapter Cable. Cable Colour: Black. 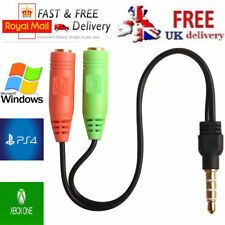 All our Product's have a 30Day Return's Policy THIS iTEM HAS A 3MOUNTH WARRANTY GOLD AUDIO / MICROPHONE headphone SPLITTER for 3.5mm Audio Jack, ALSO ALLOWS YOU TO COVERT P.C HEADSETS TO USE WITH EITHER XBOX OR PLAYSTATION This handy adapter can be used split the audio out and microphone in from your device such as smartphone, amplifier, pc or laptop must have 4 segment 3.5mm socket. also can be used for live chat this talkback adapter cable will allow you to use your PC gaming headset on either the XBOX One or the PS4 so you don't have to buy a new headset 2 x 3.5mm female jack, 3.